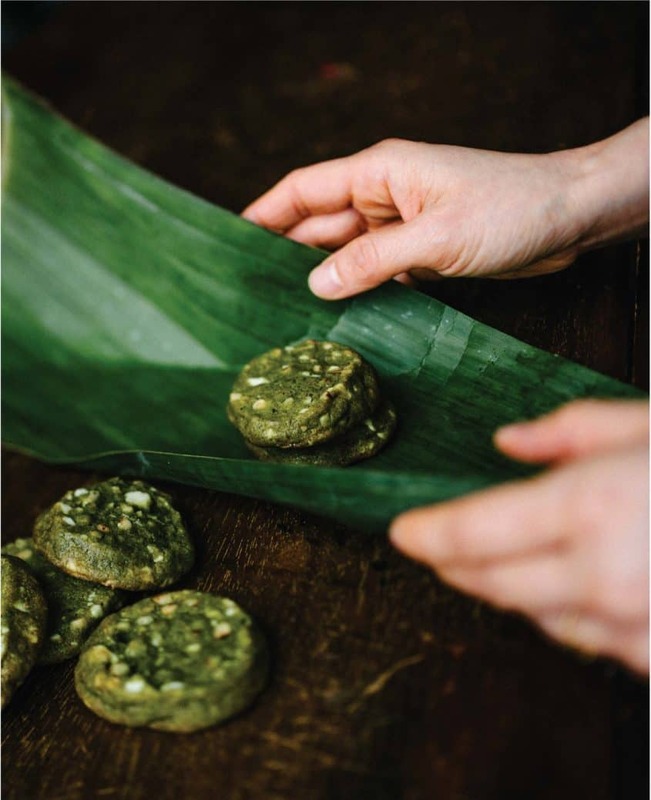 Easy to make wildly intense matcha green tea cookies. Sift the flour, baking powder, baking soda, and matcha tea powder together. Set aside. Cream the butter using a hand mixer or a stand mixer. Add the brown sugar and beat until the mixture is light and fluffy. Add the eggs and beat to combine. Mix in the flour mixture in three batches, beating well after each addition. Add the pine nuts and chocolate and stir just to incorporate. Divide the dough into four portions and set each portion on a piece of wax paper or plastic wrap. Shape the dough into 2-inch (5 cm) diameter rolls. Wrap well in the wax paper or plastic wrap, twisting both ends to seal shut. Slice each roll into 10 to 12 cookies. Place the cookies on parchment paper–lined baking sheets. Bake for 9 to 12 minutes, depending on whether you like a softer cookie or a crisper one. Using sushi mats to shape the dough into rolls will enable you to create perfectly round cookies. The cookie rolls will keep refrigerated for up to 1 week, or frozen for up to 6 months. Thaw the rolls in the refrigerator for 24 hours before slicing. Excerpted from Secrets from My Vietnamese Kitchen: Simple Recipes from My Many Mothers by Kim Thuy. Copyright © 2017 Editions Libre Expression. Translated from the French by Sheila Fischman. Recipes translated by Marie Asselin. Appetite by Random House edition published in 2019. Food Photography by Sarah Scott. Published by Appetite by Random House®, a division of Penguin Random House Canada Limited. Reproduced by arrangement with the Publisher. All rights reserved. Day 8 – NOPI & Simply Nigella Cookbooks | 12 Days of Christmas Giveaway!